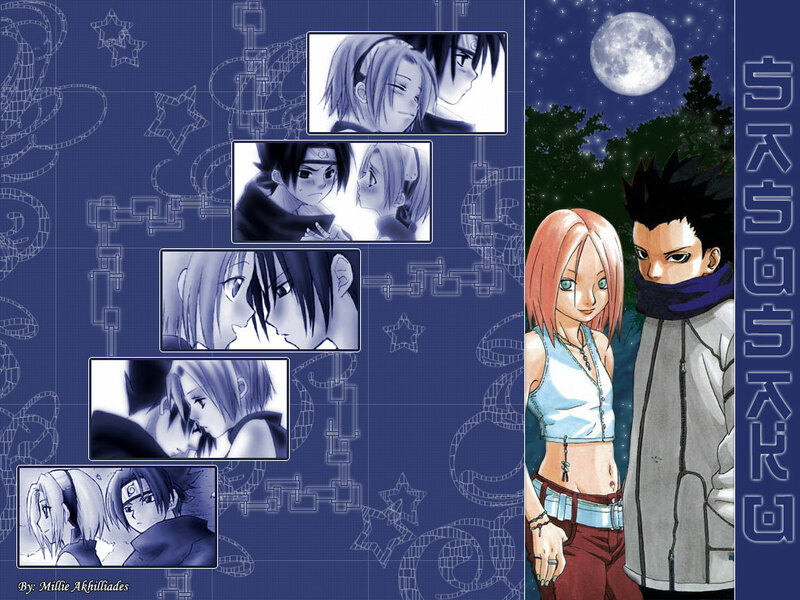 Another shipping wall... SasuSaku [again?]. Think of this one as the companion wall to Cherry Blossom Fan--that one was the 'Sakura-themed' wall, and this one is the 'Sasuke-themed wall'... since it's blue and all that. Wow!!! I love it! Those little pics are too cute! The blue BG is cool, it adds to the mood. Nice job! That's just too sweet!! I think I'm gonna add it to my favrs too!! Thank you & Keep up the great work..!! Whoaw!!! SasuSaku wall!! I would never get tired looking at a SasuSaku pics! Never! Hahahaha! Good work! Thanks for sharing!! um...i dont want 22 b all critic, but isn't that shino with sakura? Beautiful wallpaper thanks for sharing !